Congressional Democrats already had leverage in two of the big impending legislative battles this fall. Congress can’t raise the debt limit or pass “must-pass” appropriations through the reconciliation keyhole, so Republicans will be forced to muster 60 Senate votes to avoid a Democratic filibuster. The strong possibility of conservative GOP defections — especially in the House — makes some Democratic support even more essential. At the moment, it seems no significant bloc in Congress wants to play games with a debt-limit increase and risk a debt default. So a “clean” debt-limit bill, perhaps attached to some noncontroversial legislation, is currently the best bet. But the appropriations bill needed to avoid a government shutdown is another matter altogether. And the president’s explicit threat in Phoenix earlier this week to shut down the government (presumably by vetoing an appropriations measure) if he doesn’t get what he wants in the way of funding for his border wall raises the stakes even higher. Democratic leverage over appropriations is fortified by the broadly accepted understanding that as the party controlling both Congress and the White House, Republicans are likely to get the lion’s share of public blame for a government shutdown. That’s all the more true if a demand of the president’s is perceived as precipitating the crisis. But in exercising their leverage, Democrats need a clear understanding of what they are willing to accept in exchange for whatever they demand. 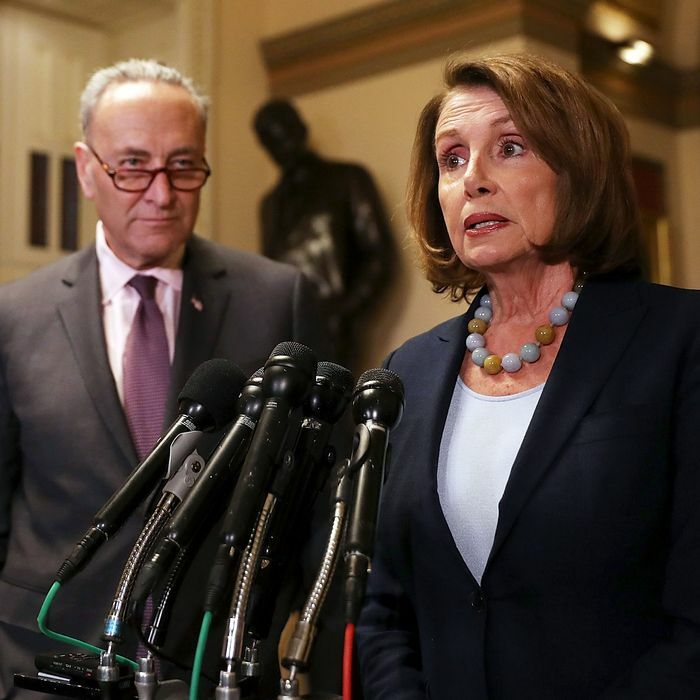 Remarks by House leader Nancy Pelosi and Senate leader Chuck Schumer in response to Trump’s government shutdown threat came pretty close to saying that they will not negotiate on a border wall. If that’s the case, the goal for congressional Democrats is pretty clear: inflicting a definitive legislative defeat on Trump while depicting him as irresponsibly pursuing a demagogic and divisive policy. Splitting the congressional GOP, much of which is lukewarm about the border wall, is a bonus. 1) A larger bargain on immigration policy in which Trump agrees to such measures as statutory protection of Dreamers (currently threatened by the temporary nature of Obama’s DACA executive order, which could get struck down in the courts even if Trump doesn’t rescind it) or even the shelving of proposals to restrict legal immigration, in exchange for border-wall money. 2) A deal that brings in some key side issues like Obamacare stabilization (especially cost-sharing reduction subsidies), CHIP reauthorization, or even voting rights. 3) A really grand bargain on fiscal issues that includes binding assurances affecting the budget and tax measures the White House and congressional Republicans are pursuing on a separate track (e.g., no Medicare or Medicaid cuts, a limit on upper-end tax cuts). And beyond all these issues, there are conservative demands that could be as aggressively advanced as Trump’s, including the House Freedom Caucus’s chronic temper tantrums for domestic spending cuts, and the powerful anti-abortion lobby’s demands for a “defunding” of Planned Parenthood, a goal so widely binding on Republicans that it made it into the last-gasp, bare-bones “skinny repeal” GOP health-care proposal. Even if Democrats reject such demands out of hand (which they have done in the past), they will affect negotiations on the other side of the table. All in all, so long as they don’t let themselves look like the sole culprits in a government-shutdown threat, Democrats are in the catbird seat in this scenario. Republicans can’t keep the government open without them, and the Democrats have fewer internal divisions on the key issues than the GOP. If they choose a strategy and stick to it, either Republicans will take the country over the cliff, or a deal dictated by Democrats will be struck, or— most likely of all — Congress will kick the can down the road a few months with a “continuing resolution” that leaves things where they are right now, with the GOP’s many promises to its “base” still unfulfilled. The Donkey Party can live with that.